In 2006, Barratt Homes secured outline planning consent from the Secretary of State for the construction of approximately 700 new dwellings on a site at Felpham, Bognor. Barratt Homes then prepared a reserved matter planning application for the scheme, which included the construction of the new Bognor Regis North Relief Road. An important consideration in constructing the road was noise mitigation for both existing and future local residents. 24 Acoustics were appointed by Barratt Homes to provide guidance on the design of acoustic bunds and noise barrier fences for the Felpham section of the relief road. 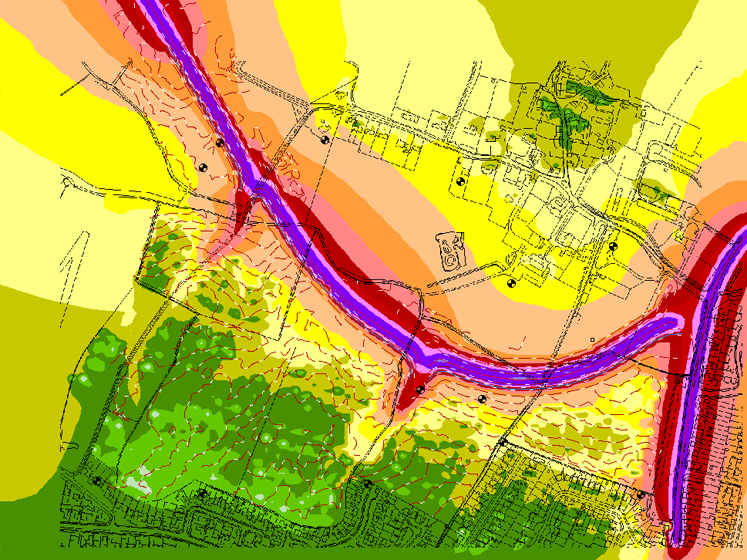 24 Acoustics worked alongside Barratt’s transportation and highways department, using detailed acoustic modelling of the new road to optimise acoustic barriers that afforded householders maximised protection from environmental noise created by the road whilst working within constraints of the scheme. Noise and planning, Transportation noise.